Figure 1. Computed tomographic scan of the head at age 54 days. A 2.1-cm soft tissue mass involves the intracoronal right orbit. The mass extends posteriorly into the right cavernous sinus. Figure 2. Ultrasound with Doppler interrogation. A 2-cm retro-orbital mass is noted. Doppler flow interrogation demonstrates the highly vascular nature of the lesions. Capillary hemangiomas are benign tumors composed of capillary endothelial cells. Fewer than 25% of lesions are present at birth, but rapid development is common in the first months of life.3 Rapid proliferation of these lesions can produce ulceration, bleeding, infection, necrosis, and compression of adjacent structures.7 Large lesions may result in thrombocytopenia secondary to intralesional platelet sequestration (Kasabach-Merrit syndrome).7,8 Most capillary hemangiomas resolve spontaneously. Typically, 50% of capillary hemangioma resolve spontaneously by age 5 years, 70% by age 7 years, 90% by age 9 years, and the rest by adolescence.2,3 The clinical course of capillary hemangioma is similar for lesions from various sites. 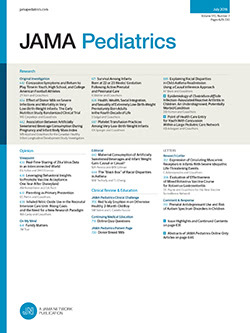 Since spontaneous regression is the rule, treatment is only indicated if visual disturbance is present.4,7 Corticosteroids are the primary pharmacologic treatment used to control hemangiomas.4,9 Interferon is effective in refractory cases.4 Use of intralesional cryotherapy and sclerosing agents are of limited value. Radiation treatment is only considered for life-threatening lesions. Because orbital capillary hemangiomas are highly vascular lesions with the blood supply directly from the internal or external carotid artery, surgical intervention poses considerable risk for massive blood loss and is rarely indicated. Other diagnostic considerations include an array of ocular and/or orbital tumors, including retinoblastoma, intraocular malignancy, solid rhabdomyosarcoma dermoid cyst, teratoma, lymphangioma, glioma, neurofibroma, and meningioma.7 Another consideration is the possibility of transplacental metastasis of maternal malignancy. Metastasis of malignancy to products of conception is rare. Fewer than 100 cases of malignant metastasis to products of conception have been reported, to our knowledge; malignant melanoma is the most common of these, accounting for nearly 30%. Leukemia, lymphoma, and breast adenocarcinoma combined account for an additional 30%.10 Metastasis to the fetus occurs in only 27% of these cases in which products of conception are involved. Eighty percent of the cases are associated with malignant melanoma or hematopoietic malignancies.10 No cases of mesothelioma metastatic to products of conception have been reported to our knowledge. In light of the clinical presentation, the well-circumscribed nature of the lesion, and the prominent vascular supply, a diagnosis of orbital capillary hemangioma was made. Because of progressive ocular manifestations, prednisone was administered, and follow-up imaging studies demonstrated no further progression of size. The infant did well and was discharged on the 70th day of life. Accepted for publication August 21, 1999. Reprints: Patrick S. Ramsey, MD, Division of Maternal-Fetal Medicine, Department of Obstetrics/Gynecology, University of Alabama at Birmingham, 618 19th Street S, Birmingham, AL 35249 (e-mail: ramsey-patrick@hotmail.com).